Pheonicia is a boardgame where the rules aren’t as clear as they could be. There are many boardgames that suffer a similar failing, so it isn’t a unique failing, but could be one reason why its on the danger (of being disposed of) list at Beyond Monopoly games club. It is a good game, but as I only play it every few months, when I can get people interested in trying it out, I tend to skim through the rules to recap whilst I explain them. I did this again, when I played on Saturday, but the next day I decided to see if anyone had done a player aid to help quick refresh set-up when I discovered something, a rule I’d missed. I saw a posting on the BGG forum about converting cards to coins, which confused me until I read further and then went and got the rules – I had been omitting using the ability to swap coins to card and vice versa. In stage 1c, you can exchange one card for coins, before applying treasury limits. This would only be useful if you had improved storage to store them. 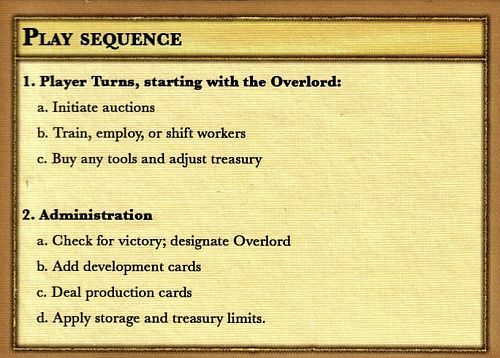 This is only useful because of what you can do in step 2c, namely turn four discs into a card. This is the rule I’d missed! Its a gamble to try and turn a 4 card into a 5 or 6, but it does mean you are not able to use the income to buy tools or train workers. However it is also useful for those not cashing in a card in 1c when a player without improved storage gets income to take them above 3. Normally people will train workers or buy farming tools just to avoid losing them on treasury limits (in 2d), but now this shouldn’t be needed. Moral of the story – read rules if you haven’t played a boardgame in a while (even if its afterwards, lol, as hopefully it’ll lodge in your brain until next play – which should be at the next BM! York.